In Saltcoats the old tidal harbour (NS 245 410) sits within the Nebbock Rocks by the town centre. The harbour can be viewed from the town shore road. The Inner Nebbock Rocks to the south of the Harbour can be viewed from the southern harbour wall. The old salt pan and Outer Nebbock Rocks to the north of the harbour can be viewed from the shore road by the hotel. There is ample car parking beside the harbour. National Cycle Route N73 from Largs to Kilwinning passes the Harbour. There is disabled parking. Concrete and metalled surfaces. The Harbour wall restricts viewing for wheelchair users. On National Route 73 from Ardrossan to Kilwinning. The area is good for waders, sea-birds and gulls, especially during the winter or on passage. 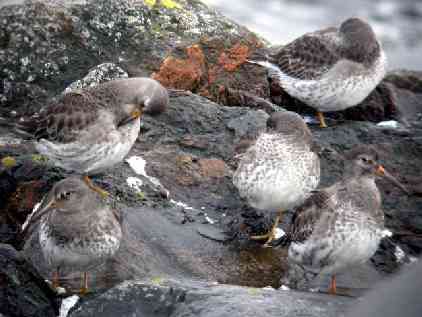 The Harbour is noted for Purple Sandpiper and Knot . The Rocks are good for Glaucous and Iceland Gull in the winter. Offshore is good for divers, grebes , and sea-duck such as Eider . King Eider has also been seen, including a superb male in June 2003. This entry was posted in Locations - North Ayrshire on 28-Jun-2003 .